I dug out my pressure canner from the abyss and put it to good use this week. We canned tomatoes, salsa, more tomatoes, and ground beef. I am all for grass-fed beef, and use it most of the time. And most everything we do eat is organic, healthy food. However, angus chuck was on sale this week for less than $2 a pound (that's almost 1/2 off!) and I wanted to put some up for the winter months. This will be perfect for soups, casseroles, sloppy joes, or tacos. I've been throwing away the greens off of beets for years, not knowing they were a veritable goldmine of goodness. Those, along with any kale, chard, or parsley I don't get to, goes into the dehydrator. After they are dry, I crush them with my hands to break them up, removing any tough stems. They then go into the blender and get pulsed to a fine powder. I have been using a heaping teaspoon in my morning kefir smoothie. 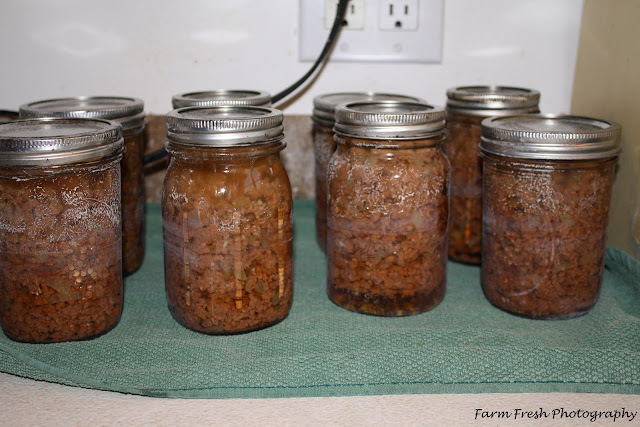 Sheesh...I hope to get back to regular blogging updates as soon as the canning season slows down. I have missed stopping by my favorite blogs and feel like I've been away on vacation! Great idea with you dehydrated beet tops! Excellent nutrition! ....and your "vintage" pressure canner I'm sure works just fine. My daughter picked one up at a rummage sale --she has it fixed up like new. I'm always looking for new ideas on how to better utilize any and everything.Thanks for the tip on dehydrating the greens.I may give it a try. Hi Cyn, I have been busy drying herbs this week. Thanks for the info. about the beet greens, I think since my dehydrator is out I will dry some greens. Great idea! Why didn't I think of that? What can I say ~ you are my hero!! awesome! I have a ton of beets and beet greens out in my garden I was wondering what Im going to do with them. Also have some chard and kale out there. I don't have a dehydrator though. I wonder if you can just air dry them ? that is how I dried my herbs from my garden and that worked out great and it even looks like I will get a second harvest off those. I have to buy a new wheat grinder and a bosh kitchen cent so I really didnt want to buy a dehydrator this year. You will be so glad you have all your canning this Winter. I so enjoyed hearing from you and catching up. I LOVE your photos and always learn so much from my visits to your place!!!! I always enjoy your blog, Cindy. I wish I lived next door to you! Lol. Thanks for all the great kitchen & health ideas! How do you put up meat? It looks like the meat has been cooked? I need to be better about preserving my garden. Your blog is certianly inspiring me! Thanks for also taking the time to stop in and encouraging me today. It was an interesting day, but we got through it! Good for you to get all that produce put up for the winter months!! Yippee! !